Today’s card was “heavily” cased from the 2018-19 Annual Stampin’ Up! Catalog, page 135 using the Floral Frames stamp set and Foliage Frame Framelits Dies. As you can see, the card front was only changed by using a different sentiment and some different colors. The INSIDE of the card however, is a different story. This is where the Artistically Asian stamp set (page 134) comes in. Unfortunately, we all need a card to send a friend who has gotten bad news or something unpleasant has happened. By pairing the Floral Frames with Artistically Asian stamp sets we can create such a card. As a result, we can see how Stampin’ Up! 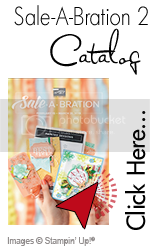 stamp sets can coordinate with other stamp sets to get a desired outcome. A bonus is the Floral Frames Bundle sells for a 10% discount and makes it so easy to use this set. Take a look at some of the details. Now you might be saying, “Ain’t nobody got time for this card!” Well, that is what my stampin’ club members said before they made the card but, consequently changed their tune. Let me give you a few tips. There is a Soft Sea Foam layer on top of the card base. The floral frame image was stamped with Versamark and gold heat embossed onto the card front. All the Garden Green foliage was cut with a pass of one die through the Big Shot. The Foliage Frame Framelits have two of several dies…going in opposite directions. You can see what I am talking about in this photo. These are what need to be die cut using Tranquil Tide and Whisper White card stock. Many of us love the look of the very thin metallic thread when we see it on other peoples projects. However, it took me some time to get a handle on the way it works best for me without ending up with a knotted mess. I will share “my way” in the instructions below and hope it helps you too. After rubbing the panel of Soft Sea Foam with the Embossing Buddy, stamp the floral frame image with Versamark and gold heat emboss the floral frame image as shown in the photo. Stamp ‘sending love’ with Tranquil Tide ink onto the square Whisper White piece. Big Shot Work: Die cut the floral framed foliage from Garden Green and the other pieces as shown in photo above. Use the #2 (from the center) Stitched Shapes circle thinlit to die cut the sentiment. Punch one Starburst from the gold foil piece. Use liquid glue to adhere the sentiment layer onto the gold Starburst. Set aside. For placement of the foliage, see the photo. TIP: Add a nickle sized circle of liquid glue to the very center of the Garden Green foliage and adhere to the card front. After that, tuck the smaller foliage pieces under the main piece. Liquid glue gives you some wiggle room for the small pieces. Now that you have the foliage in place, it is time for the metallic thread and the sentiment layer. “My way” of adding the metallic thread is to wrap it generously around all four spread out fingers of one hand 7-8 times ending just past the area where you started and cut the thread. Add a dimensional between the two loose ends. Take the back off the dimensional and adhere it to an outside area of Garden Green foliage (where it will be hidden by the sentiment layer). Very gently, spread the thread out. Add 3 dimensionals to the back of the sentiment – not in the spot where the sentiment will layer onto the dimensional already on the card. Finally, adhere to the center of the foliage. The 3 dimensionals will hold the other areas of the metallic thread as well as the sentiment. In case this does not make sense, here are some photos. Adhere the finished front panel to the card base with liquid glue. Stamp the artistically Asian sentiment in Tranquil tide to the 4″ x 5 1/4″ Whisper White panel. Stamp the trio floral stamp to the upper right and lower left to sort of frame the sentiment. Adhere panel inside the card. Stamp the floral trio again on the lower left corner of the envelope.